Chon Chi literally means Heaven and Earth, it is in the orient interpreted as the creation of the world or the beginning of the human history and therefore it is the initial pattern practiced by the beginner. This pattern consists of two similar parts, one to represent Heaven and the other Earth. 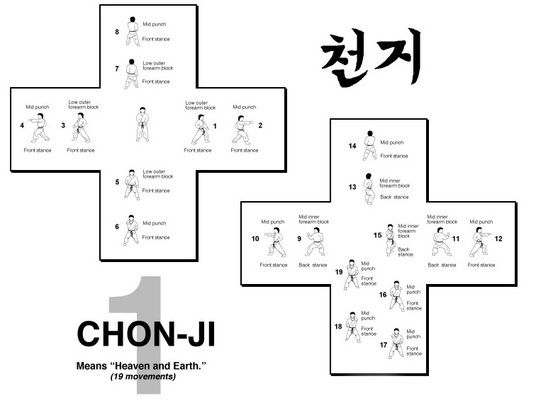 To see me perform Chon Ji Tul or to see the diagram for Chon Ji Tul or to see the Korean and English translations for the movements in this pattern, please click here. 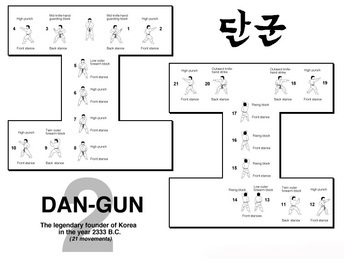 Dan Gun Tul consists of 21 movements. 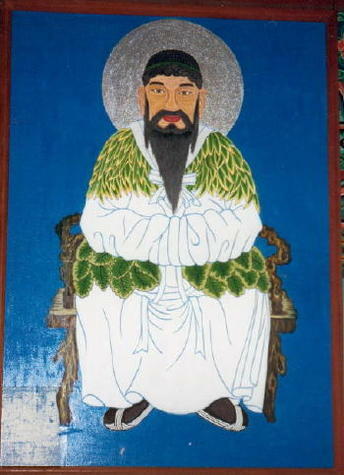 Dan Gun is named after the holy Dan Gun, the legendary founder of Korea in the year 2333 B.C. 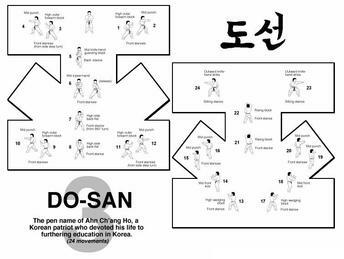 To see me perform Dan Gun Tul or to see the diagram for Dan Gun Tul or to see the Korean and English translations for the movements in this pattern, please click here. Do San Tul consists of 24 movements. 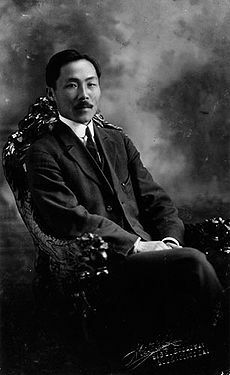 Do San is the pseudonym of the patriot Ahn Ch'ang Ho (1876 - 1938), he devoted his entire life to furthering the education of Korea and it's independence movement. To see me perform Do San Tul or to see the diagram for Do San Tul or to see the Korean and English translations for the movements in this pattern, please click here. Won Hyo consists of 28 movements. Won Hyo was the noted monk who introduced Buddhism to the Sill Dynasty in the year 686 A.D.
To see me perform Won Hyo Tul or to see the diagram for Won Hyo Tul or to see the Korean and English translations for the movements in this pattern, please click here. 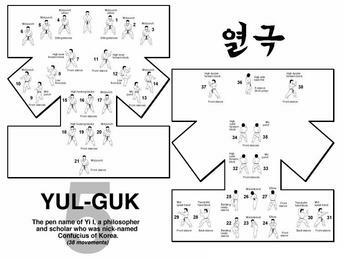 Yul Gok consists of 38 movements. 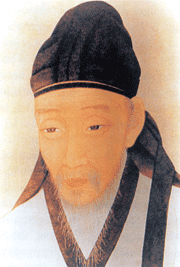 Yul Gok is the pseudonym of the great philosopher and scholar Yi I (1536 - 1584) nicknamed "Confucius of Korea". The 38 movements of this pattern refer to his birthplace on 38 degrees latitude and the diagram represents scholar. To see me performYul Gok Tul or to see the diagram for Yul Gok Tul or to see the Korean and English translations for the movements in this pattern, please click here. 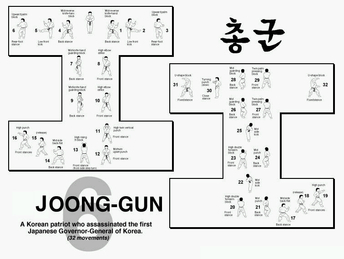 Joong Gun Tol consists of 32 movements. Joong Gun is named after the patriot Ahn Joong Gun who assassinated Hiro Bumi Ito, the first Japanese governor-general of Korea, known as the man who paid the leading part in the Korea - Japan merger. There are 32 movements in this pattern to represent My Ahn's age when he was executed at Lui Shung Prison (1910). To see me perform Joong Gun Tul or to see the diagram for Joong Gun Tul or to see the Korean and English translations for the movements in this pattern, please click here. 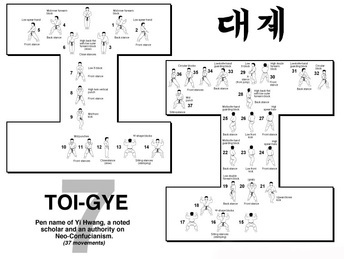 Toi Gye consists to 37 movements. Toi Gye is the pen name of the noted scholar Yi Hwang (16th century), an authority on neo-Confucianism, the 37 movements of the pattern refer to his birthplace on 37 degrees latitude and the diagram represents scholar. To see me perform Toi Gye Tul or to see the diagram for Toi Gye Tul or to see the Korean and English translations for the movements in this pattern, please click here. 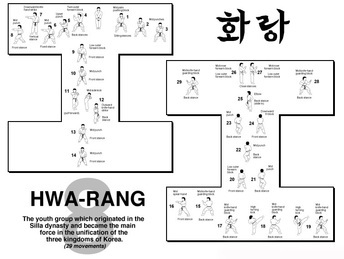 Hwa Rang consists of 29 movements. Hwa Rang is named after the Hwa Rang youth group which originated in the Silla Dynasty in the early 7th century. 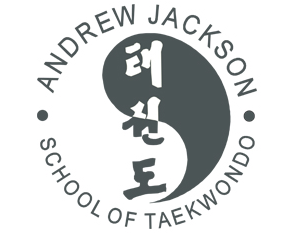 the 29 movements refer the 29th Infantry Division, where Taekwondo developed into maturity. To see me perform Hwa Rang Tul or to see the diagram for Hwa Rang Tul or to see the Korean and English translations for the movements in this pattern, please click here. 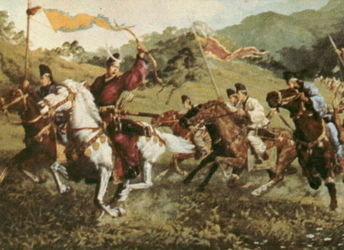 Chung Moo consists of 30 movements. 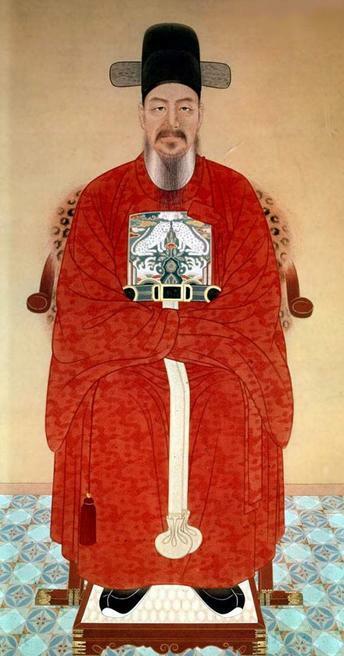 Chung Moo was the given name to the great Admiral Yi Soon Sin of the Yi Dynasty. He was reputed to have invented the first armoured battle ship (Kobukson) in 1592, which is said to be the precursor of the present day submarine. The reason why this pattern ends with the left hand attack is to symbolise his regrettable death, having no chance to show his unrestrained potentiality checked by the forced reservation of his loyalty to the King. To see me perform Choong Moo Tul or to see the diagram for Choong Moo Tul or to see the Korean and English translations for the movements in this pattern, please click here.